Recently I read an article in a FLM magazine by Errol Morris called “13 Questions and Answers on the Filmmaking of Errol Morris“. For years I’ve been intrigued by the amazing footage that Morris captures using his own custom way of filming interviews. He calls it the Interrotron and it’s a technique that I’ve spoken to many of my film-school friends about. In “The Fog of War”, “Fast, Cheap and Out of Control” and many other Morris’ movies, the interview subjects stare straight into the camera while responding to a voice interviewing them from off screen. Here is the interview as lifted from the magazine’s website. I have attempted to maintain the design and layout. I did add the picture of the Interrotron from another source. Q: Is it true that you interview people using a machine? A: Yes, the (patent pending) Interrotron. It’s a machine that uses existing technology in a new and novel way. When I made my first film, Gates of Heaven, I interviewed people by putting my head right up against the lens of the camera. I would be talking to them, and it seemed as though they were looking directly into the lens of the camera, but not really. Almost, but not quite. Of course, they were looking a little bit off to the side. Q: Why? What’s the point? A: To create the first person. When someone watches my films, it is as though the characters are talking directly to them…There is no third party. On television we’re used to seeing people interviewed 60 Minutes style. There is Mike Wallace or Larry King, and the camera is off to the side. Hence, we, the audience, are also off to the side. We’re the fly-on-the-wall, so to speak, watching two people talking. But we’ve lost something. A: Uh huh. We all know when someone makes eye contact with us. It is a moment of drama. Perhaps it’s a serial killer telling us that he’s about to kill us; or a loved one acknowledging a moment of affection. Regardless, it’s a moment with dramatic value. We know when people make eye contact with us, look away and then make eye contact again. It’s an essential part of communication. And yet, it is lost in standard interviews on film. That is, until the Interrotron. Q: I don’t get it. A: I got tired of sitting so close to the camera. (In my early films, my cameraman would grab the back of my head and pull me back because you could see the side of my head in the lens. When he yanked me back, it often hurt.) And I started to wonder, what if I could become one with the camera. What if the camera and myself could become one and the same? A: Well, not literally. Are you familiar with Teleprompters? A: Well, Teleprompters are used to project an image on a two-way mirror. Politicians and newscasters use them so that they can read text and look into the lens of the camera at the same time. What interests me is that nobody thought of using them for anything other than to display text: read a speech or read the news and look into the lens of the camera. A: I changed that. I put my face on the Teleprompter or, strictly speaking, my live video image. For the first time, I could be talking to someone, and they could be talking to me and at the same time looking directly into the lens of the camera. Now, there was no looking off slightly to the side. No more faux first person. This was the true first person. Q: It sounds like Buck Rogers. Were people willing to tolerate this? A: I worried at first. Would it frighten people? Would they run out of the studio screaming? Who could say? I used it for the first time in Fast, Cheap & Out of Control. And it worked like a charm. People loved the Interrotron. Q: The Interrotron? Did you make up the name? A: No, it was named by my wife, Julia Sheehan. She liked the name because it combined two important concepts — terror and interview. Q: But doesn’t the device intimidate people? A: Oddly enough, no. It doesn’t. People, if anything, feel more relaxed when talking to a live video image. My production designer, Ted Bafaloukos, said, “The beauty of this thing is that it allows people to do what they do best. Watch television…” We often think of technology as working against the possibility of intimacy. But there are so many counter-examples. The telephone is a good counter-example. There are things we can say to each other on the phone that we would never say if we were in the same room. You know, “Being there is the next best thing to using the phone…” The Interrotron is like that. It creates greater distance and greater intimacy. And it also creates the true first person. Now, when people make eye contact with me, it can be preserved on film. Q: Have you used it much? A: Whenever I need to. I used it in a film that introduced the Academy Awards® in 2002. Gorbachev, Laura Bush, Iggy Pop, Al Sharpton and Walter Cronkite have all been on the Interrotron. Q: Did Robert McNamara like it? A: Well, you have to remember that we are talking about someone who has been interviewed a thousand times. He walked into the studio and said, “What is that?” I smiled and said, “The Interrotron.” He said, “Well, whatever it is, I don’t like it.” But then he sat down, and we proceeded to record over twenty hours of interviews. I guess he came to like it, too. 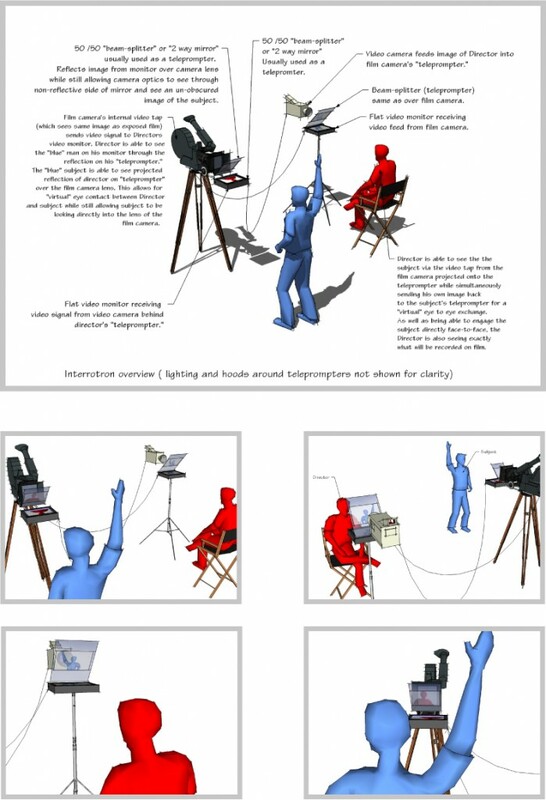 Morris used the interrotron to make the Academy Awards Movie. Imagine, a special screen that displays the live, disembodied image of Morris as he shouts out questions, makes funny faces and orders his subjects to repeat things. And just who are some of the 98 people who appear in the Academy Awards Movie? Well, if you look closely you’ll see: Jerry Brown (then the Mayor of Oakland, CA), Martin L. Perl (1995 Nobel Laureate in Physics), Alice Waters (Chef, Chez Panisse, Berkeley CA), the late Susan Sontag (writer), William L. Brown, Jr. (then the Mayor of San Francisco), Carolina Herrera (New York fashion designer), Iggy Pop (musician), Donald Trump (entrepreneur), Sidney Coleman (Professor of Quantum Field Theory, Harvard University), Laura Bush (First Lady of the United States), Jello Biafra (former lead singer of The Dead Kennedys), Philip Glass (avant-garde musician and composer), Fran Lebowitz (writer), Lou Reed (musician), Rev. Al Sharpton (President, National Action Network), Mikhail Gorbachev (Former President of the Soviet Union), Walter Cronkite (retired journalist), Laurie Anderson (musician and performance artist), Kenneth J. Arrow (1972 Nobel Laureate in Economics), Urvahi Vaid (gay rights activist) and Eric Lander (Director, Center for Genome Research at MIT) among many others. Vancouver Designers, get ready for the http://t.co/uYyI0nWzTa!